The power of Kale is amazing! It has superfood qualities with high ranks in calcium, Vit K, Iron and is extremely low calorie for your bridal waistline! 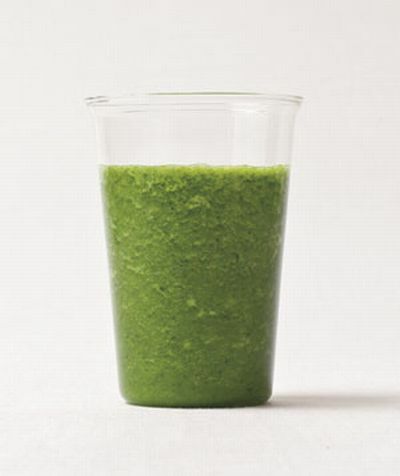 Here is my lazy recipe for a delicious kale smoothie. It doesn’t get any easier than this and sometimes I don’t have fresh pineapple and just use the banana to sweeten it. You can throw in any fresh fruit you have on hand to add some flavor. Step 1: Fill the Blender with kale. I don’t have time to measure out the kale – the more the better and one blender full works for me! Step 2: Add the almond milk and banana and any other fresh fruit your tastebuds crave into the blender. Step 3: Add ice if you want to make sure it’s extra cold. Step 4: Keep blending until you can’t blend anymore. I suggest you make sure the chunks of kale are fully blended, it makes it more enjoyable on the way down. This is a great energy boost to add in after your workouts and is a simple recipe that you can add almost anything to. If you don’t fancy smoothies, I found 50 other things you can do with Kale on Chocolate and Zucchini’s site!